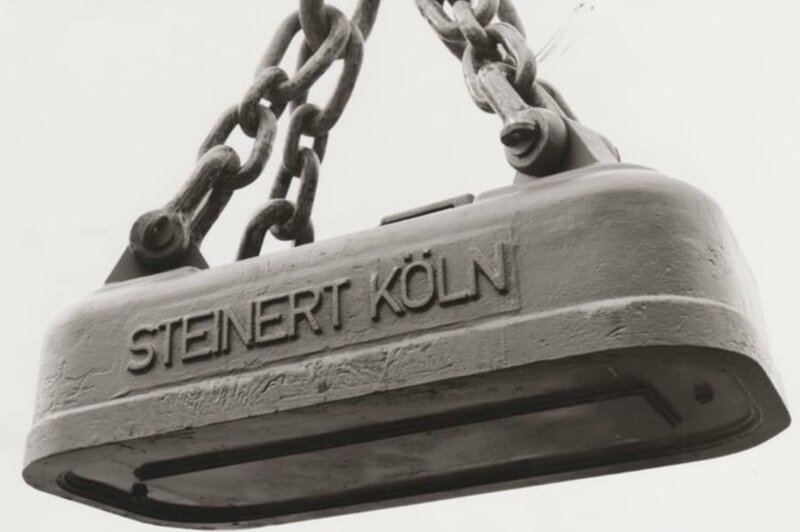 STEINERT, founded by Ferdinand Steinert, can look back over a long and diverse history. 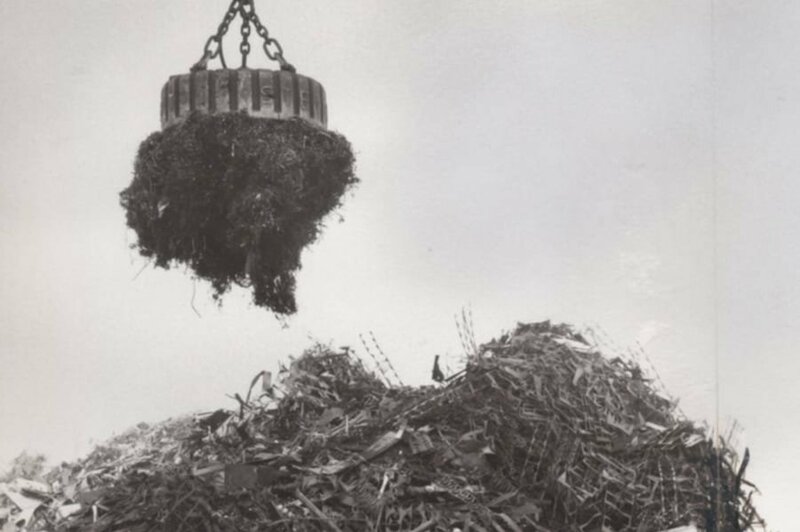 Documents more than 100 years old provide evidence of our founder’s pioneering achievements; steeped in history, they are the starting point for an ongoing journey starting with the separation of compact clumps of iron right up to the high-tech filtering of delicate micro-particles. Right from the start, the objective of the founder Ferdinand Steinert was clear: efficient recycling! Delve into the interesting facts and figures documenting our exciting history. In 1889, Ferdinand Steinert founds “Ferdinand STEINERT Elektromagnetische Aufbereitungsanlagen” in Cologne. The new company initially works in small structures, but the market for the use of separation magnets is huge. While we have been aware of the phenomenon of magnetism since the eleventh century, it has so far been put to very little economic use. The steel industry is one of the company's first customers. The design engineer Ferdinand Steinert develops magnets, which are used to recover iron from steel slag and steel waste, and from waste in foundries and iron works. It’s an effective procedure, which soon becomes more widespread as it becomes possible to separate coal from slag. This further technical refinement is of great interest to the state railways, for example, which become a major client of STEINERT. At the start of the new century, the economic conditions are ideal for the new company. The order books are full, customers are flooding in from mining, shipbuilding, dockyards and the steel industry. 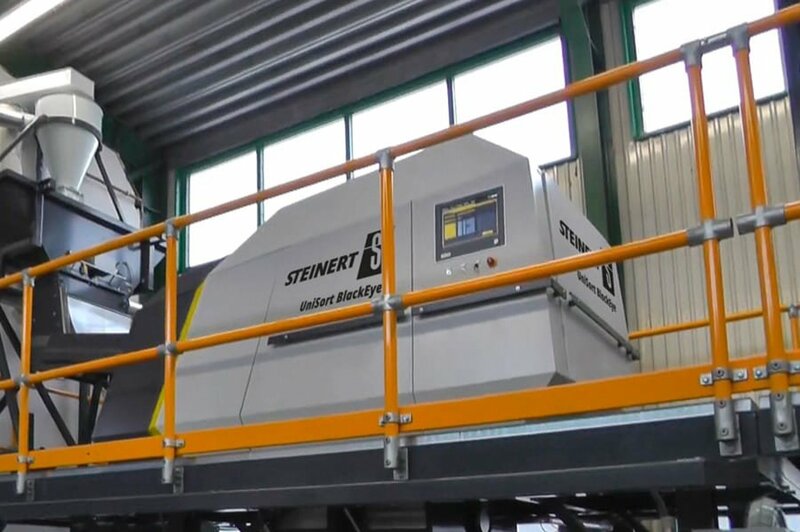 Demand is increasing and STEINERT is growing with the technical challenges of the time. It’s been a long time since separator magnets had to work with chunky hammers or iron lugs alone, the objects to be separated are getting smaller and the technology is becoming ever more complex. 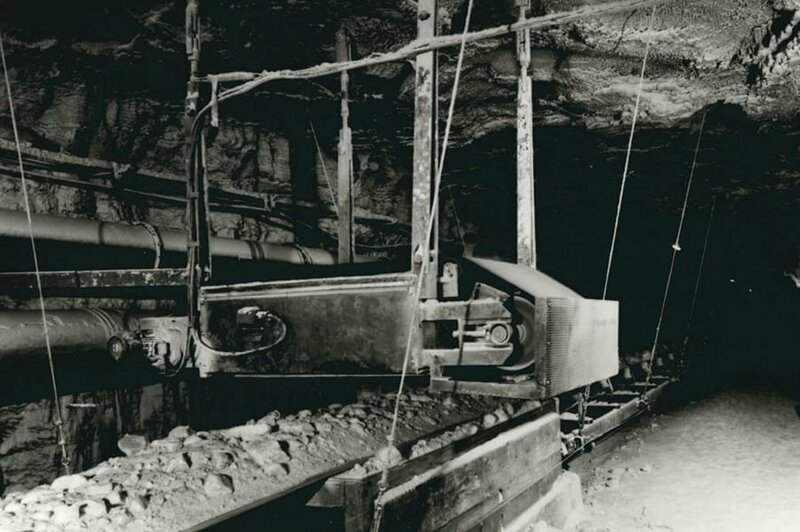 Increasingly, the machinery working in coal pits has to cleanly filter smaller waste products, like thin igniting wires or bent drill rods, out of bulk material. STEINERT responds by expanding its product range to meet the ever-changing market situation: magnets are now available for sale as standalone units. Alongside separation work, the lifting magnet market is growing in importance. In 1931, Julius Christian Buchholz acquires “Ferdinand STEINERT Elektromagnetische Aufbereitungsanlagen”. The birth of the Metalloxyd holding company helps to consolidate the market position: the two companies complement one another perfectly. Customers benefit from a combination of development expertise and the way the strong synergies interact. One of the first major results of the merger is the breakthrough in anodic oxidation. STEINERT is the first company to use anodised aluminium conductors to manufacture coils. The anodised coating, which is used as an electric insulation layer, eliminates the need to wrap or paint the aluminium conductors. This is a process which will be continually enhanced over the coming decades. During the Second World War, most of the premises in Cologne are destroyed. But management and staff aren’t discouraged by the ravages of the war and swiftly push forward with reconstruction and expand the product range. STEINERT becomes established on the international market. After the years of reconstruction, STEINERT introduces innovative new products to quickly write the next chapter of its success story. In 1963, the company presents the prototype of a new range of lifting magnets on its own stand at the trade fair in Hanover. The benefits of this prototype are its low weight, improved magnetic capacity and low price. At the same time, waste treatment and recycling gain in importance during the 1960s. Dwindling resources, calls for environmental protection, and an explosion of costs on the raw materials market make new technologies indispensable. STEINERT rises to these challenges with immense passion and the development of new products. 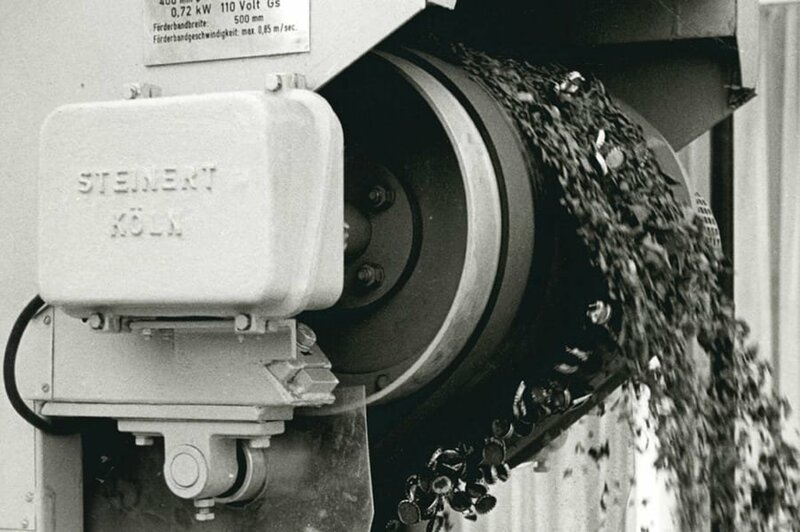 In 1966, STEINERT presents the first overhead suspension magnet which recovers iron from shredder material, municipal solid waste, demolition waste, garbage and steelwork slag. Several thousand of these machines are put into use around the globe over the next few years. At the end of the 1960s, STEINERT develops an innovative product that clearly marks the company out as a world market leader, displacing US competitors in the process. This is the Anofol strip. While the Americans use conventional copper windings in their coils, STEINERT is the first to use anodised aluminium strips. The compact coil, which can thereby be produced, is distinguished mainly by its excellent fill factor and extremely good heat dissipation. 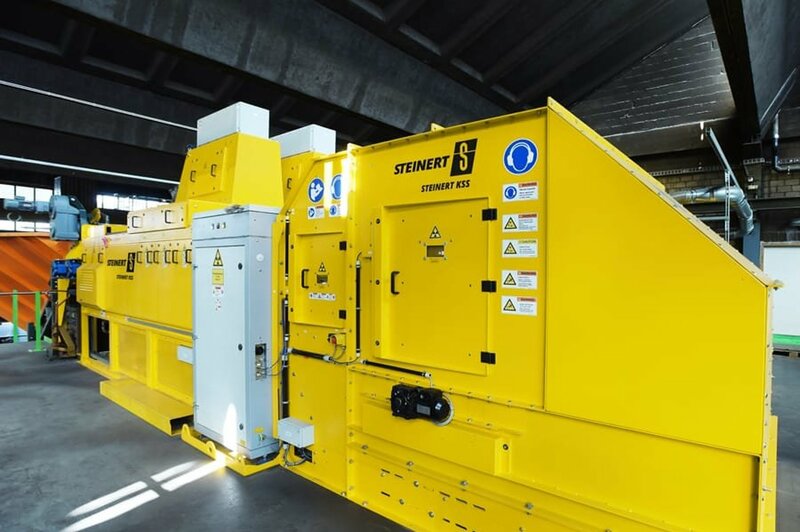 This innovation adds further drive to STEINERT’s growth and is also put to successful use in areas of industry new to the company. Over the following years, development and production processes shift their focus increasingly towards separation. Economic change sees the market share of lifting magnets fall. But the company responds quickly and sees increasing demands on the part of customers as a new challenge. 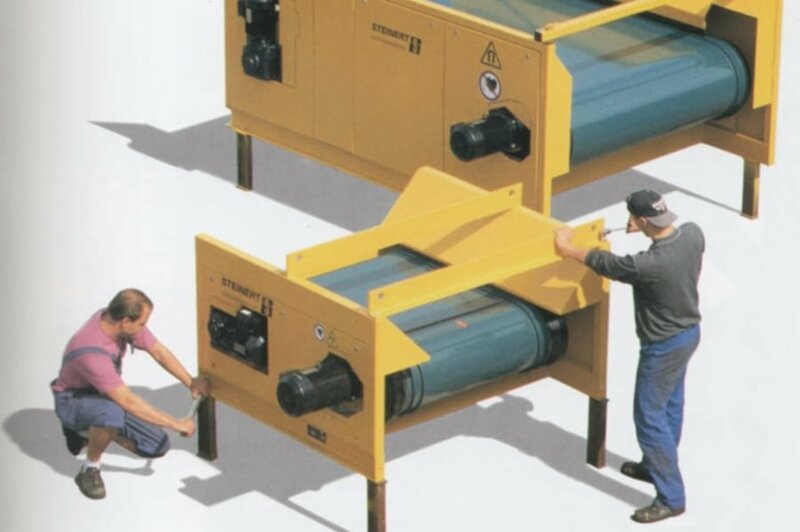 In 1987, STEINERT presents the first eccentric non-ferrous metal separator used to recover non-ferrous metals, such as aluminium, copper, magnesium and brass, and which replaces the centric system. Once again STEINERT demonstrates itself to be a leading pioneer for an entire sector. The new millennium starts with a deliberate injection of new blood from the next generation within the company and the expansion of intensive research and development, which will bring new, and in some cases unique, devices onto the sorting technology market over the coming years. New subsidiaries and sales partnerships also reinforce STEINERT’s global presence. The advances made in sensors and computer technology enable the specific development of FSS colour sorting systems and ISS® induction sorting systems. Both types of machinery aim to further increase the amount of metal produced using 100% mechanical processes. During this boom period for raw materials, it is especially the ISS® induction sorting system first launched in 2001 - which enjoys global acceptance on the metal recycling market. In parallel to this, new markets open up in the recovery of refuse-derived fuels, wood treatment and plastic recycling. STEINERT enters a new sector with the development and presentation of the HGF high-gradient magnetic filter. The matrix separator with permanent magnets enables incredibly fine magnetic elements to be removed from process liquids for the first time with an efficiency of more than 90%. Today, the STEINERT HGF is used all around the world. It has also become established in the biotechnology sector, enabling this promising field to also benefit from innovative STEINERT technology. In 2003, the HGS high gradient magnetic separator is presented. This separates out the finest magnetic components in salt and construction chemicals. The tremendous success of STEINERT products on the North American market results in the founding of STEINERT US LTD in St. Petersburg, Florida, in conjunction with a long-term agent. Customers in the USA soon benefit from the expanded infrastructure and reward the new company with more and more orders. An important step towards recognising customers all around the globe is the takeover of Sturton-Gill in Australia in 2004. Currently known as STEINERT Australia Pty. Ltd., the Melbourne-based company is one of the leading manufacturers of magnets in the Asia-Pacific region and is a supplier to the expanding local recycling industry and the global minerals industry. A significant share of the products manufactured are exported from Australia to China. STEINERT’s high-quality products are a real hit with customers. For example, around 2200 non-ferrous metal separators with an eccentric magnet system were sold by the end of 2007, making it the most popular eddy current separator in the world. STEINERT’s success continues. An efficient sales network is built up with dedicated and established companies in Brazil and Japan. The majority takeover of RTT Systemtechnik GmbH, Zittau, and the name change to RTT STEINERT GmbH in 2009 expands the product range yet further: the UniSort brand is developed and enters production. Steinert is still the only manufacturer of magnetic and sensor sorting technology for metals and plastics. 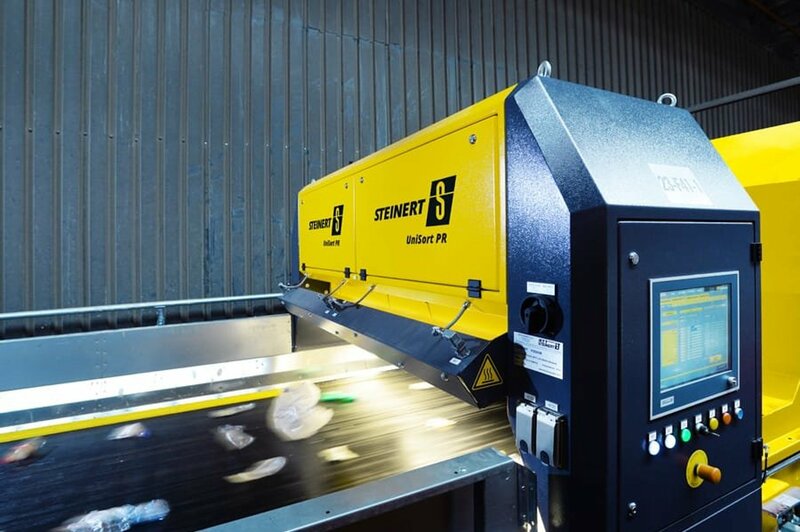 By developing and launching the UniSort BlackEye, STEINERT once again demonstrates its pioneering spirit for the development of new leading technologies: This sensor-based sorting machine doesn’t just separate plastics by colour, but also by polymer class, such as PE, PP, PVC and styrene. As well as black plastics, the UniSort BlackEye can therefore correctly sort plastics of all colours. Not only does this benefit the environment but also the recycling industry, as it allows mixed plastics to be recovered and recycled more profitably. 2018 - Combining sensors and responding flexibly to the future. Our STEINERT KSS (combination sorting system) is a platform for various sensors which includes 3D, colour and induction recognition. The system can also be fitted with a fourth sensor (near-infrared, x-ray transmission or x-ray fluorescence sensor). The software developed in-house at STEINERT also allows new recognition algorithms to be produced and, if necessary, used at short notice to overcome new challenges.